With a dash of mayo, slices of honey ham, a decorated cheese topping, and a bright flash of green avocado slices, my sandwich became part of The Bento Who Lived. At least, until lunchtime today. The first time I saw a Harry Potter book was at the UH bookstore. I was wandering around looking for snacks and something to read in my boring Astronomy class when I saw a display of young adult books. It sounded great, so I bought it and started reading it in class. I could not put it down. I read as I walked my next class and finished the book by that afternoon. It was the best thing I’d read in forever. The Goblet of Fire became the second book that had ever made me cry (first was Where the Red Fern Grows). I talked over the title with Jenn today and we both agreed that although using the word ‘that’ was correct, ‘who’ sounded better in Harry Potter terms. I’m going to the midnight show tonight with my brother, thus ensuring zombie status tomorrow at work. I’m about to burst open with excitement!! 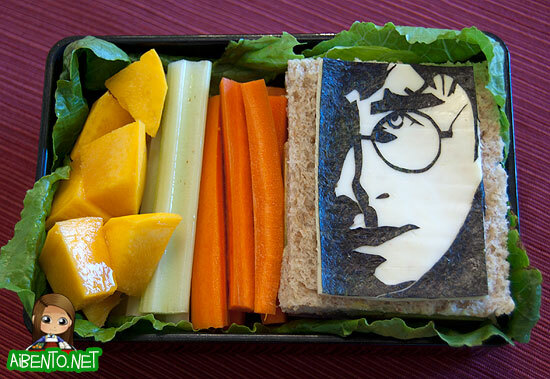 This is a pretty simple sandwich bento, made with ham and avocado, surrounded by some Avada Kedavra lettuce. 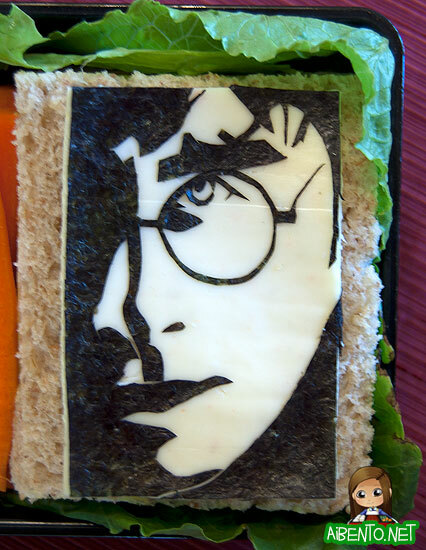 Harry is cut out of nori and is on a slice of pepperjack cheese. I have to assemble everything during lunch, putting him into the sandwich and then adding the lettuce in. On the side I have carrot and celery sticks to dip into the little single serving cup of humus I have. Next to that I have some chopped puree mango from our tree outside. Here’s a close-up of the cutout, though it’s a bit blurry. I thought I’d have a terrible time with the eye, but that turned out pretty good. I decided I didn’t need to use the shadows of his glasses and stuff, so that made it a lot simpler. Hope all you fans like the bento and to everyone seeing the movie this weekend, have fun! !